Let me just go on the record by saying that it is tricky trying to work out what to finish timber with, and this is particularly so for the novice and environmentally conscious. The more I look into it and think I understand, the wider the field expands! Wood finishing is a highly complicated and somewhat scientific field. What works for one species is not necessarily the best product for another. Sometimes the best decision is NOT to finish the wood, like this naturally eroded Ulin board on the left which has a beautiful patina on the surface from years of being walked on. It has been finished by body oils seeping out through the soles of people’s feet and into the wood. But generally speaking, for outdoor applications in particular, finishing wood is a good idea. It helps provide protection against the sun’s harmful rays and the rain. Let’s start with a little guidance. Last time we looked at the different types of wood finishes available. Pretty much all types of wood finishes fit into 4 broad classes: oil, wax, varnish and pigments. This issue surveys some higher-quality products available in Indonesia that you won’t find in your local building supplies shop. 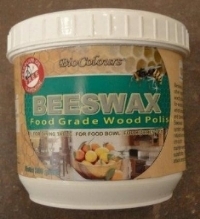 Description: Food-grade wax suitable for finishing wood products that will come into contact with food. Description: A natural product free from solvents. Made from linseed oil and beeswax. Apply directly on wood surface. Made in: Germany, Sweden, North America and China. Description: For untreated wooden floors exposed to normal or heavy wear. Matt surface finish with lustre, longer drying time. Description: For untreated wooden floors exposed to normal or heavy wear. Finish is a matt surface with a lustre. Description: Bona Deck oil is a hardening & penetrating oil designed for protection of exterior wooden deckings. It is based on pine and linseed oil and contains additives that reduce the effects of UV-radiation on the wood. 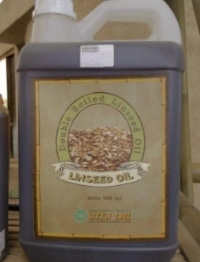 Description: Linseed oil is a natural finish oil which polymerizes into a solid form, dries quickly, and is used to produce linoleum flooring and paints, and for waterproofing wooden surfboards. Description: Tung oil is an extract from the seeds of the tung tree which when applied to paints and coatings polymerizes into a waterproof coating. Description: For new and newly cleaned wooden decks. Protects against UV-rays and ensures a hard-wearing and water-resistant surface. Transparent primer for outdoor wood. Protects against UV-rays and ensures a hard-wearing and water-resistant surface. For new and newly cleaned exterior furniture. Protects against UV-rays and ensures a hard-wearing and water-repellent surface.